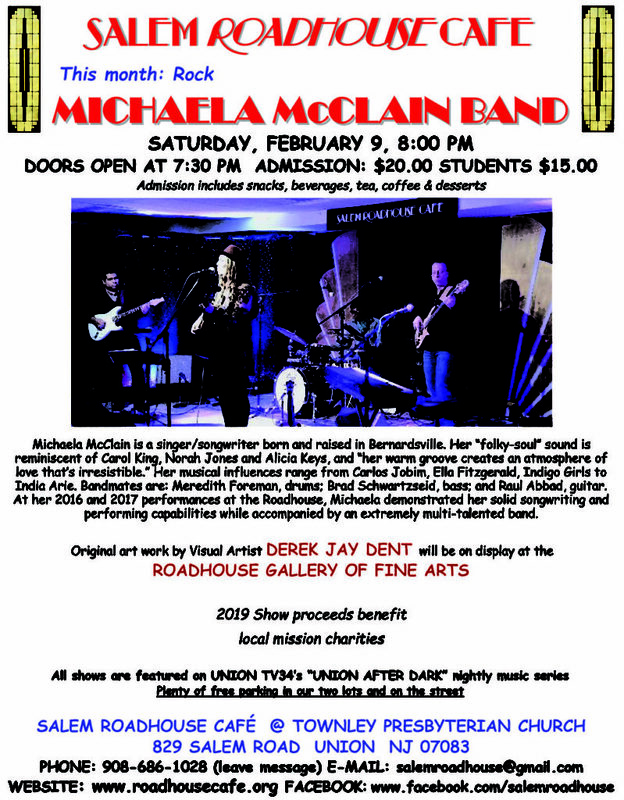 The Salem Roadhouse Café, 829 Salem Road, Union, NJ, proudly presents The Michaela McClain Band, performing on Saturday, February 9, 2019. Michaela McClain is a singer/songwriter born and raised in Bernardsville. Her “folky-soul” sound is reminiscent of Carol King, Norah Jones and Alicia Keys, and “her warm groove creates an atmosphere of love that’s irresistible.” Her musical influences range from Carlos Jobim, Ella Fitzgerald, Indigo Girls to India Arie. Michaela writes the music for the band. Bandmates are: Meredith Foreman, drums; Brad Schwartzseid, bass; and Raul Abbad, guitar. At her 2016 and 2017 performances at the Roadhouse Cafe, Michaela demonstrated her solid songwriting and performing capabilities while accompanied by an extremely multi-talented band. Each band member wowed the audiences with their individual playing, as well as playing together as a dynamic band. The featured visual artist for the February show is Derek Jay Dent. Derek does some incredibly creative work with collage themed around jazz and music. His work will be on display for everyone before, during and after the show, with gallery lights up full at door opening and during the break, and immediately after the show. Fans won’t want to miss this live, up front and personal event. All ages are welcome. It’s a wholesome show, so bring the entire family! Doors open 7:30 p.m. The show starts at 8:00 p.m. Admission is $20 and includes the show, snacks, beverages and dessert. Proceeds help local charity missions. Plan now for an evening of great music in Northern New Jersey’s Most Intimate Coffeehouse™. Dedication best defines the Salem Roadhouse Café: dedication to excellent music and dedication to the community. In its tenth year, The Salem Roadhouse Café reaffirms its commitment to both. Started in 2008 by members of Townley Presbyterian Church with a grant from the Presbytery of Elizabeth, the Roadhouse Café continues to operate as a non-profit that raises funds for several carefully chosen local charities. That may be its social mission… but the Roadhouse Café is and has been a solid performance venue beloved by the musicians who play there because of its special intimacy with the audience. The Roadhouse Café has always offered its stage to local and independent main stream musicians. It’s a clean, safe place for people who enjoy listening to live music, in a world of clubs and bars. Jazz, rock, folk and other groups have performed. During the past ten years well over 100 different entertainers have appeared. Local fine artists also display their works. The Salem Roadhouse Café has raised funds for many carefully chosen charities. They include: The Presbytery of Elizabeth E-port Center, Center For Hope Hospice, Community Food Bank, Monarch Housing, Angel Paws Animal Rescue, National MS Society, Haiti Disaster Relief, Hurricane Sandy Disaster Relief, The Union County YWCA Domestic Violence Program, Making It Possible To End Homelessness, Camp Johnsonburg, The Music Institute, Groundwork Elizabeth, Union Twp. Police “Santa In Blue” toy campaign and others. Thousands of dollars have been raised for these deserving charities. The musicians who play the Roadhouse often ask to return as soon as possible. The Roadhouse has given them a place with a beautiful stage, good acoustics, a live, attentive audience, and a sound system that is first class. Now well into its eleventh year of operation, the Salem Roadhouse Café features many of the performers who have graced the stage in the past, as well as talent that is new to the Café stage. The current season will benefit local charities.